In the dungeons of Devarque, a vengeful wizard lay in shackles, plotting his escape. 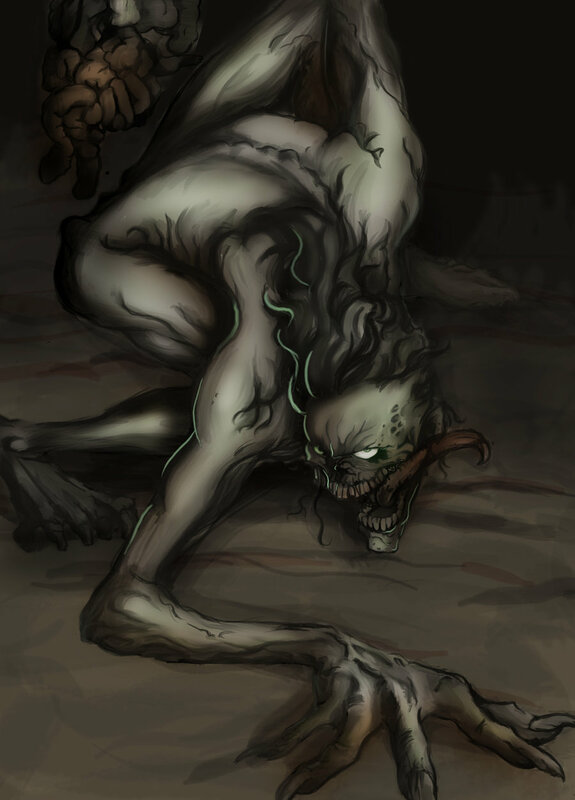 He shared his cell with a gibbering creature known as N'aix, a thief cursed by the Vile Council with longevity, so that its life-sentence for theft and cozening might be as punishing as possible. Over the years, its chains had corroded, along with its sanity; N'aix retained no memory of its former life and no longer dreamt of escape. Seeing a perfect vessel for his plans, the wizard wove a spell of Infestation and cast his life-force into N'aix's body, intending to compel N'aix to sacrifice itself in a frenzy of violence while the mage returned to his body and crept away unnoticed. Instead, the wizard found his mind caught in a vortex of madness so powerful that it swept away his plans and shattered his will. Jarred to consciousness by the sudden infusion of fresh life, N'aix woke from its nightmare of madness and obeyed the disembodied voice that filled its skull, which had only the one thought: To escape. In that moment Lifestealer was born. The creature cast its mind into dungeon guards and soldiers, compelling them to open locks and cut down their companions, opening an unobstructed path to freedom while feeding on their lives. Lifestealer still wears the broken shackles as a warning that none may hold him, but on the inside remains a prisoner. Two minds inhabit the single form--a nameless creature of malevolent cunning, and the Master whose voice he pretends to obey. Naix is the best jungler in DotA, he can jungle conveniently since he’s Level 1. He use lifesteal to survive in jungle. 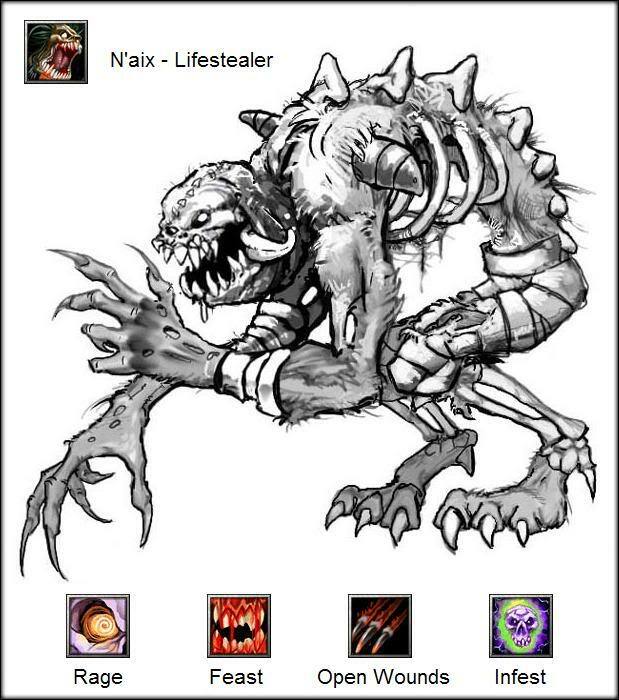 Like his name, Lifestealer is the best lifesteal-er in DotA, all his skill are designed to maximize his lifesteal ability. That makes him one of the best one-by-one hero in DotA, he never lack of HP because he always receive new HP from stealing others. A decent jungler, can start jungling on level 1, and jungling easily Only attack a single target if you don't buy a BattleFury or get any cleave skill. Launch into a maddened rage, becoming immune to magic spells and gaining increased attack speed. 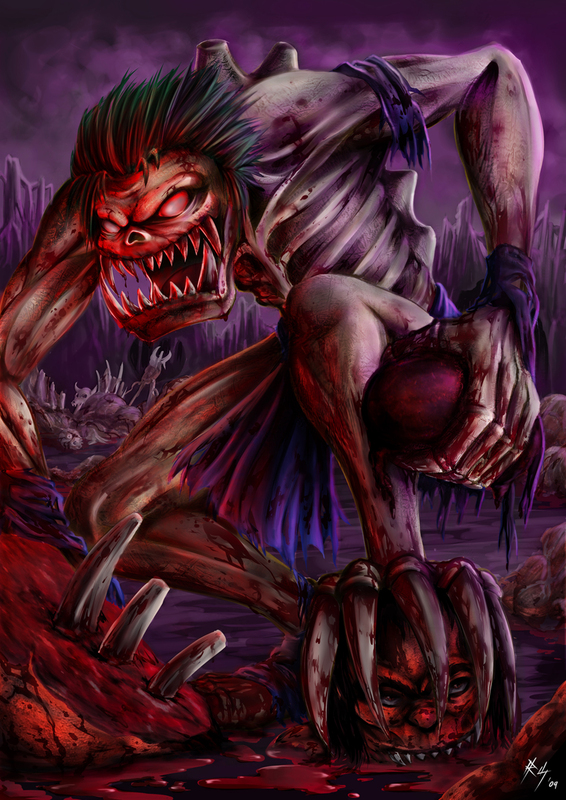 The madness and brutality of N'aix makes him a vicious and unrelenting foe in combat. Rage is a skill you use to carry your team into victory. With this skill, you gain an additional attack speed that will make you to deal lots of damage to enemy. The most important is: You gain magic immunity during the duration of this skill. With the magic immunity, you will be inuvlnerable to magic and become an outstanding hero in a teamfight. Regenerates a portion of the attacked enemy's current HP and deals the same portion of damage per attack. 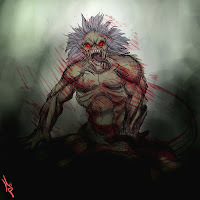 After escaping from his cell in Devarque, N'aix subsisted on flesh and bones of those unfortunate to cross his path. This skill is your main lifeteal skill. You need this to do jungle on early-mid game. With this skill, you can survive in jungle and get enough farm to get nice items for becoming a carry for your team. This skill depends on enemy's HP, the more his HP the more your attack. so if you fight a thousands HP enemy on late game, this skill will really helps you. Lifestealer rends an enemy unit, slowing the victim's movespeed and allowing all allies to lifesteal on that unit. All damage dealt will steal life, including damage from spells. The victim recovers movement speed over the duration. Fresh wounds and the scent of blood often draw out the scavengers to finish the job. 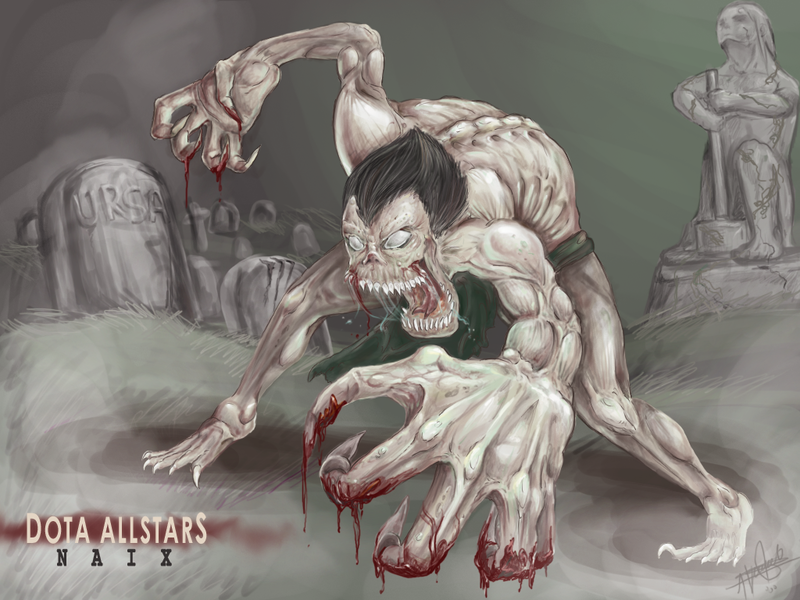 Slowing sown your enemy, this skill makes you can easily catch your opponent. He (your target) will be slowed and cannot run from you. Also, the attacker of your target will gain an additional lifesteal whether it is a magic attack or normal attack. With this, skill, and combined with Feast, your lifesteal will be so high and can absorb so many HP from your opponent. Lifestealer will infest the body of the target unit, lying dormant and undetectable inside. When he reveals himself, he deals damage to all nearby enemy units. The Lifestealer can gain experience from units that die while he is Infesting a unit. 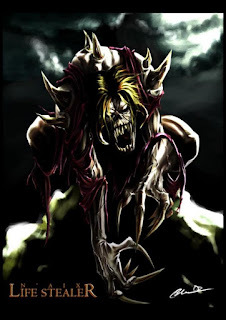 If the unit is a creep, he will devour it first, gaining health equal to the unit's current HP. Does not work on enemy Heroes. With this infestation, N'aix consumes the life blood of the host, restoring him back to full unholy power. Going inside a unit, creeps (ally or foe, or jungle) and hero (ally). With this skill you can do fast farming in jungle because it will make your target instantly explode and you get the gold and experience, very good to use infeest on big creeps like Centaur, Wildkin, Troll, etc. This skill is also deal damage near the explosion after you consume your target. So it is also a decent damage dealer to initaite a temfight and fight enemy. For initiating with this skill, go inside your friend and if he already arrives and attack your opponent, come out, it will deal damage to all nearby enemy. Don't afraid, your friend will not exploding like a creep. This skill is also useful for escaping. If you are on a difficult situation and must run, you can go inside the creep and stay there. usually enemy will follow the creep where there are you inside it. You may call your friends to help you and save you from the enemy. Lifestealer eats the host body from the inside out. If you want to steal firstblood, take Open Wound on level 1, it will sow down enemy so your team can kill him. Why maxed Feast first? You need this mainly for jungling. With this skill, you will be able to survive in the jungle. With the lifesteal, you can survive and not killed by the creeps. On late game, this skill will helps you to survive in the teamfights vs. heroes. Why maxed Crystal Nova before Arcane Aura? Rage before Open Wound? You will need the extra magic imuunity duration for rage for your defense in teamfights. And Open Wound Level 1 is enough for early-mid game. Once the game start, I recommend you to straight go into the easy camp in the jungle. (Don’t make yourself visible in the easy camps right in sec 30 into the game, or you will waste your time waiting there). Quelling Blade + Stout Shield + Feast is enough to kill the easy camp in level 1. Keep fighting the easy camps after you are ready to fight aother creeps. Maybe at level 3-4 you already have enough ower to fight vs Stone Golem or Ogre. And in level 5-6 you can fight Centaur, Troll, etc. Hand of midas is considered a good item for you. With mudas, you can get exp and gold faster than without midas. Very recommended to buy this as your 1st item. Keep jungling is the best option. Why not? 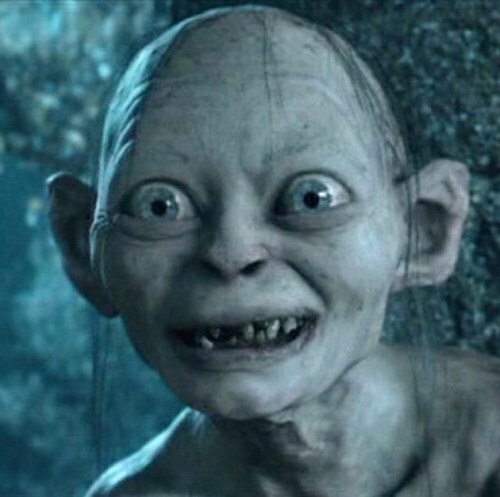 You are the best jungler in Dota, you can jungle easily and become the highest level + the richest in the game. After you have your boots (Pt is recommended) and maybe you already level 10+, you now can farm the ancients. Ancients give the most gold than other camps (except Roshan). Very recommended for you to focus Farming in just 2 main location > 1. Ancients, 2. Large canps the nearest to the ancient camp. With just focus farming in these location, and keep calm, you will reach enough gold to carry the team. Also remember to use Midas to big creeps like Centaur, Wildkin etc. And also if you want to be faster in farming, use Infest to creeps, it will instantly kill the creeps and don’t waste your time attacking the creeps. On late game it is your time to shine. You are the carry. You are the one who will save your team from loss. Carry the team into victory. You should already have some nice items that will deal lots of damage to enemies. There is many possibility for Naix. You can buy Desolator+Mordiggian or you can buy Tarrasque + Mkb or Basher? There are lots of possibilities for you. Just choose one you are into it and carry your team with it. The key of successful carry is: be focus on one target, focus, and focus. Right click the right target, not the creeps. And after you succeeded kill your target, you can change to another target. Oh I almost forgot, you can initiate a teamfight by using Infest into your friend, and come out if your friend already near the enemies. Infest also useful to run from enemies. This is your full equipment for Level 1 Jungling. Quelling Blade to deal damage, Stout Shield to Block damage, and tango for HP regeneration. Why Hand of Midas? It will boost your golds and exp so you can be the richest in the maps. Why Power Threads? Power threads is a flexible shoes, you can change it to STR, AGI, or INT for what you need. STR for damage and Survivability, this can save your life by using the STR Thread if you are on low HP and run from enemy. Add +152 HP instantly. INT for mana, this can give you instant 104 Mana if: You are need to last hit enemy hero and if you don;t use your skill, he will escape. For Naix, for stable use, choose the STR, then if you need to cast a skill and on a low mana, change to INT. Usually people choose this as a Naix core early-mid item. Drains 40 HP per second. when the bonus strength is gone, or the health drain per second. Why Armlet of Mordiggian It will gives you damage, attack speed, and HP instantly. A very good skill for a carry-tank like you. Deactivate Armlet if not in a teamfight. Can Save your live if you are below 500 HP and enemy want to nuke-kill you. Use this to instantly adds 475 HP. For all melee carry and don't hava a natural cleaving ability, this item is a must have. Passive: Cleave - Deals a percent of attack damage in a 225 AoE around the target. Does not work on ranged heroes. Why Battlefury? Cleaving attack is a must for late game teamfight. You need a fast attack speed, cleaving high damage. This is what you need to knock-down all enemies. Also if you misclick your target and you attack the creep, or if you are back-out and can't think in a teamfight. Cleave attack will save your face. + 40 Strength + 300 Health HEALTH RESTORED: 2% Cooldown: 6 Passive: Assault Aura - Grants attack speed and armor to nearby allied units, and decreases armor for nearby enemies. Multiple instances of Assault Aura do not stack. Why you need Survivability on a late game? Late game rule is: Who can survive in a teamfight, is the winner. So Survivability to winning a dotA game. For a carry, DPS is always not enough. 8. You can increase your DPS more. Choose your own DPS items.As a carry, damage is your priority. Active: Teleport - Teleports you to an allied non-hero unit or structure. Why Boots of Travel? With the creeps becoming more powerful in pushing your base, you need fast teleport to save your Ancient. Magnus: 1. Have + damage and cleave to increase your damage. him, kill the chased target. He can move fast as lightning with his ultimate, ride him! They have global teleport and you can ride on them and teleport freely. Become invisible and surprise gank your foe by riding on an Invisibility hero. Your lifesteal depends on enemy's HP, the more his HP the more your attack. But Huskar is different, he get more outstanding the less HP he have, the stronger he become, the weaker you become, how's that! Get Free Dota 2 Items at GamersNab.com by completing easy offers or survey.